Fall midterms are quickly approaching and your “exam anxiety” might be on the rise. What do you study? How do you prepare? Where do you start? Don’t panic! 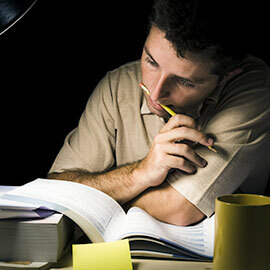 Instead, read through our top five study strategies, provided by Michael Lisetto-Smith, manager of the Study Skills and Supplemental Instruction Centre at Laurier’s Waterloo campus, to help you get studying successfully. 1. Regular studying throughout the term. Reviewing content on a regular basis better prepares you for tests and allows you to make connections between new knowledge and previous knowledge. Aim for one hour of review each week per course. Self-testing allows you to figure what you do know (or don’t know) about a certain topic. Self-testing can also boost your confidence and reduce pre-test anxiety. Take advantage of the review questions found in many textbooks and online courses. 3. Take time for study breaks. Organize your studying in to smaller chunks of time – approximately 45-90 minutes each – instead of a major cram session. Your brain needs time to rest and absorb the new information you’re giving it. If you need to break sooner than 45 minutes, do so. Reviewing previous test results is an important step in the studying process as it allows you to reflect on study strategies that may not have worked, and to identify gaps in knowledge. Ask yourself what you can do this time around to avoid repeating mistakes of the past. Midterms can be stressful, especially if you’re writing them for the first time. You can manage your stress more effectively if you’re getting enough sleep, making time for physical activity, and eating well. Skip the late nights, make time for the gym or yoga, and resist the temptation to live off coffee and fast food for the next few weeks. Your mind – and body – will thank you. Study Skills and Supplemental Instruction (SSSI) centre workshops (Waterloo campus). Centre for Student Success workshops (Brantford campus). Study skills webinar (myHelpSpace in your MyLS account). Student Wellness Centre (Waterloo and Brantford campuses).